Home › The Sperm Donor Program at Sperm Bank Inc. The Sperm Donor Program at Sperm Bank Inc. Since 1980, our goal has been to give hope to those struggling with infertility. We invite you to partake in our sperm donor program and start building your family. At the Fertility Center of California we are firmly committed to providing the highest standards of patient care and only the most exceptional caliber of donor sperm. Whether you are looking for anonymous sperm donors, the directed donor program, or would like to donate sperm, follow the links below for more information. Become a Sperm Donor. Apply Today! The Fertility Center of California offers free online access to a portion of each sperm donor's profile at our sperm bank. If a donor piques your interest, you can apply for access to the password protected sperm donor database which shows in-depth profiles for each sperm donor for a small fee. Start your free sperm donor search! If you already have access to our sperm donor database, login here to search for donors. If you would like more information about our database, click here to get started. We provide only the most exceptional donor sperm at our sperm bank for assisted reproductive procedures. Learn more about our strict screening standards and approval process which yields high quality donor sperm. Our donor of the month features some of the most attractive sperm donor candidates at our sperm bank. Donors of the month are chosen for desirable physical appearances, educational backgrounds, personalities, and talents. Meet the current sperm donor of the month. Congratulations! You’ve chosen a sperm donor from our database and are ready to move forward in the selection process. Access the necessary patient forms, cost & pricing information and read about our special promotions. Follow these steps to purchase donor sperm. Some patients feel more comfortable having a close family friend or relative donate sperm. There are many specific legal, medical, and social considerations involved in a directed donor approach. Read more about utilizing a known sperm donor. Thank you for your interest in sperm donation. 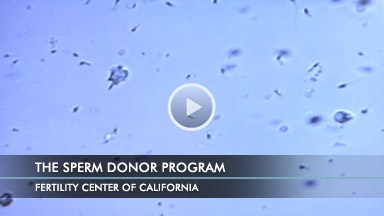 Donating sperm is a generous act that can help another family achieve their dreams. We have strict standards for our donor sperm at the Fertility Center of California and welcome applications from qualified candidates. Learn more about our sperm donor requirements. What Type of Sperm Donor Will You Choose: Anonymous vs. Directed (Known) Donors? There are two types of sperm donors, anonymous sperm donors and directed sperm donors (also referred to as known donors). Anonymous sperm donors are the donors found in a sperm donor database. You have no relationship with the donor and their identity remains anonymous. A directed donor or known donor, is a close friend or relative that is willing to donate sperm. There are advantages to each type of sperm donor program. With a known donor you will have a more complete medical history, but it can create complicated relationships. With an anonymous sperm donor, you will not have to worry about defining the donor's relationship with your child. You can also more easily find a donor with your blood type, to safeguard your child from accidentally discovering they are not biologically related to both parents. Whichever type of sperm donor you decide to use, the Fertility Center of California has the professional expertise and technology to help you on your journey.